Home / GST / How to Setoff Input Credit in GST Regime? How to Setoff Input Credit in GST Regime? Filing of GSTR 3B is a monthly process till march 2018 and dealer needs to pay GST monthly basis. But lots of people facing problem in taking Input Credit in their return because they are not aware about adjustment process of GST. Sumit Purchase Interstate goods from Rohit Int. of Rs. 10000 @ 18% IGST Tax 1800 = Total 11800. Tax Liability is showing as minus in above table, it means Input needs to setoff with Tax Liability. Now we need to do adjustment to show order of Input Tax adjustment in order. As per rule First we need to set off IGST with IGST, Second IGST With CGST and Third IGST with SGST. In above table we adjust IGST with CGST and then SGST and net tax payable is Rs. 1080, pay it with challan and make set off. Its done. Note: CGST and SGST cannot be adjust with each other. 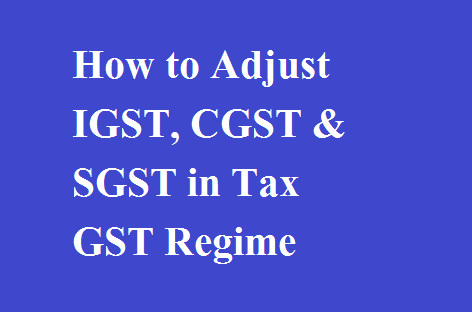 The same can be applied with set off of First CGST with CGST, Second CGST with IGST and not CGST with SGST because CGST cannot be adjust with SGST. The same can be applied with set off of First SGST with SGST, Second SGST with IGST and not SGST with CGST because SGST cannot be adjust with CGST. In another example Input Credit of CGST and SGST is Rs. 5000 each and total of Rs. 10000/- and output liability of Rs. 8000 of IGST. In above Table our Tax liability of IGST adjusted first with CGST and Balance adjusted with SGST and net tax liability is nil. Our input credit of SGST having balance of Rs. 2000 will be appear in our GST Credit Ledger.